Explore the magnificent Doneraile Park with your Free Audio Guide. 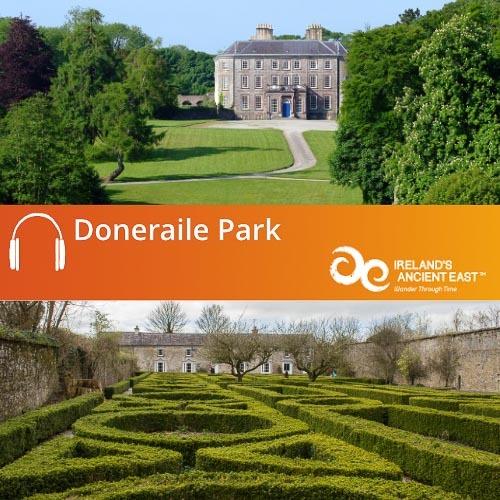 This free to download MP3 audio guide will lead you around Doneraile Park, one of Ireland’s true hidden gems! Home to the noble St. Leger family for over four hundred years, Doneraile Park is regarded as a place of exceptional beauty and character. Our audioguide will lead you through the beautiful grounds of Doneraile Park and its unique and historic gardens. You will hear the story of the St. Leger family and some of their notable guests and characters associated with the Park. Packed with stories and tales, music and folklore, the guide is an enjoyable, informative and immersive experience. Nestled by the banks of the River Awbeg in a scenic valley in North Cork, Doneraile is one of Ireland’s true hidden gems, where in the four hundred acres of dedicated parkland, you can discover over four hundred years of gardening history. Our audio guide will lead you through this beautiful landscape and tell you the stories, history and heritage of Doneraile – a truly unique and atmospheric place. This audioguide was produced in conjunction with Doneraile Development Association, Ballyhoura Development Ltd, and The Office of Public Works. Our audio guide will lead you on a fascinating journey through time at Doneraile Park. The professionally narrated audio guide is packed with fun facts, historical information, stories, folklore and legends, and is full of music and sound effects to help immerse listeners in the story. After you take our tour, here are a few suggestions for other great things to do in Ballyhoura and County Cork. Try our other guides for the Ballyhoura Region, including Bruff Heritage Trail and Kilmallock’s Medieval Marvels.